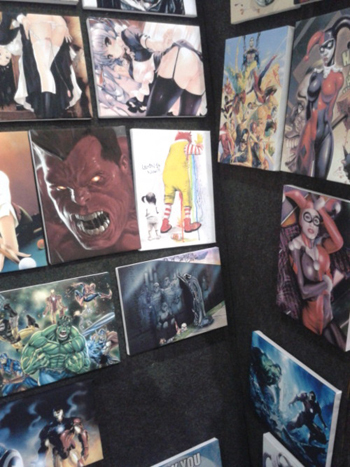 At least 25 comic-book-inspired deviantART prints were stolen and sold. Twice a year, fans of movies, comics, and other media pack into London's ExCeL Exhibition Center to take part in the MCM Expo. It's a massive event that sees celebrities, fans and vendors come together to celebrate their shared passions. The first round of this year's events took place last weekend and has been marred by allegations from a tumblr user that a vendor at the show sold prints of images stolen from deviantART users. Donna Evans, known in the deviantART community as tavington, noticed some striking similarities between drawings at the stall in question and drawings she'd seen on the artist networking site. She snapped a picture of the prints available at the stall (seen above) and asked her fans to help find the artists who really created the work. After identifying some of the pieces as stolen, Evans posted another topic on her deviantART journal. In that post, she and her followers have found at least 25 works from site users that were reproduced without permission and sold by the vendor. The stall operator "didn't have any business cards" and is still unknown. The stolen art includes fan drawings inspired by comics, movies and television programs. Evans has since updated her tumblr with more photos from the booth, showing hundreds of potentially stolen pieces of art up for sale. She is asking everyone to take a glance at the pictures and to share the story with others in order to identify the works stolen and the stall operator.